The Satirical Christian: Westboro Baptists make KKK seem respectable! In a remarkable turn of events the Ku Klux Klan has come to the defence of sanity as it protested against Westboro Baptists at a ceremony to honour fallen American soldiers. Compared to that, the KKK appeared to be entirely reasonable. But wouldn't you think that when the KKK turns up to say that you are too extreme - you might just think twice about what you are doing? 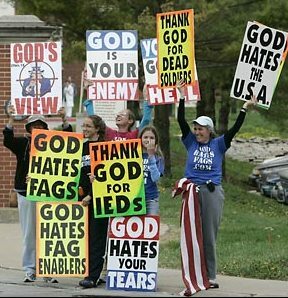 Not a bit of it - a Westboro Church member is reported to have said, "The KKK have no moral authority on anything" although this does seem rich from the group which pickets the funerals of soldiers and homosexuals, singing and shouting words of hatred in the name of God. What the KKK will do with their new found respectability is anyone's guess, but one thing is for sure - since the US Supreme Court ruled in favour of Westboro Baptist Church in March, these 'Christians' will be free spread their message of a God who hates, and a Church which is always ready to condemn. Now I wonder what God will say ...? Perhaps "The down escalator is over there"
Still, in the whole body of the church there has to an arse. And all that comes out of an arse is ... well, you get the idea! It doesn't matter what God will say, since they have only ever listened to the parts they prefer.